I love my Victorian brick-walled garden it looks charming and is full of character, however, the brickwork can be a bit dark. 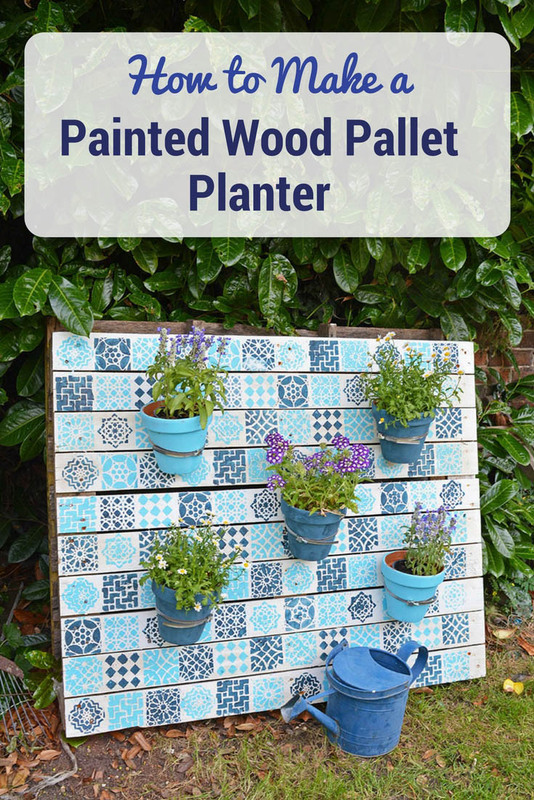 That’s why a made a painted wood pallet planter for my garden to brighten up and add colour. I’m really into Moroccan tiling at the moment and decided that I wanted to recreate the effect with paint. Also, I just love the colour blue, last week I even did some indigo Shibori dyeing on my outdoor sofa. 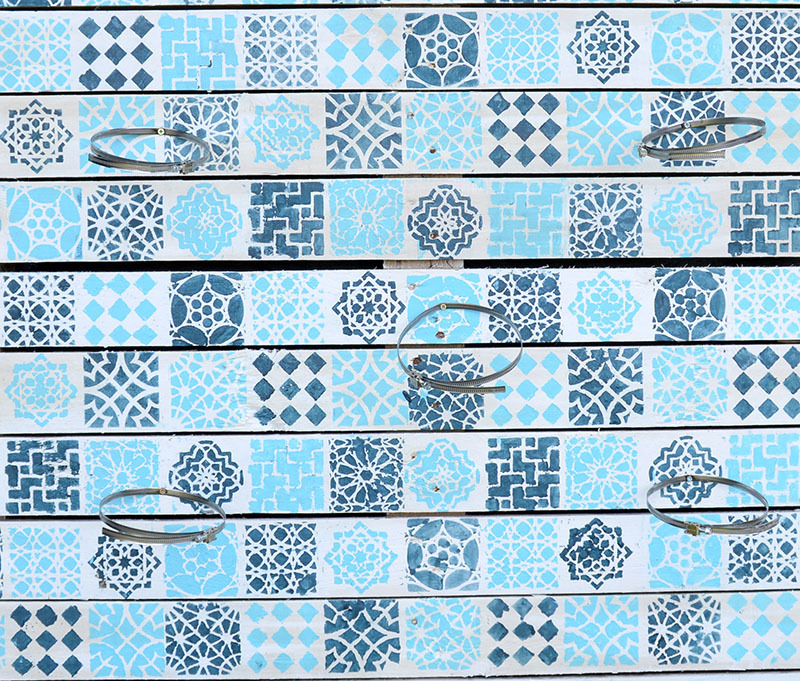 To recreate that Moroccan tiled look I stenciled a wooden pallet with a Moroccan style stencil. 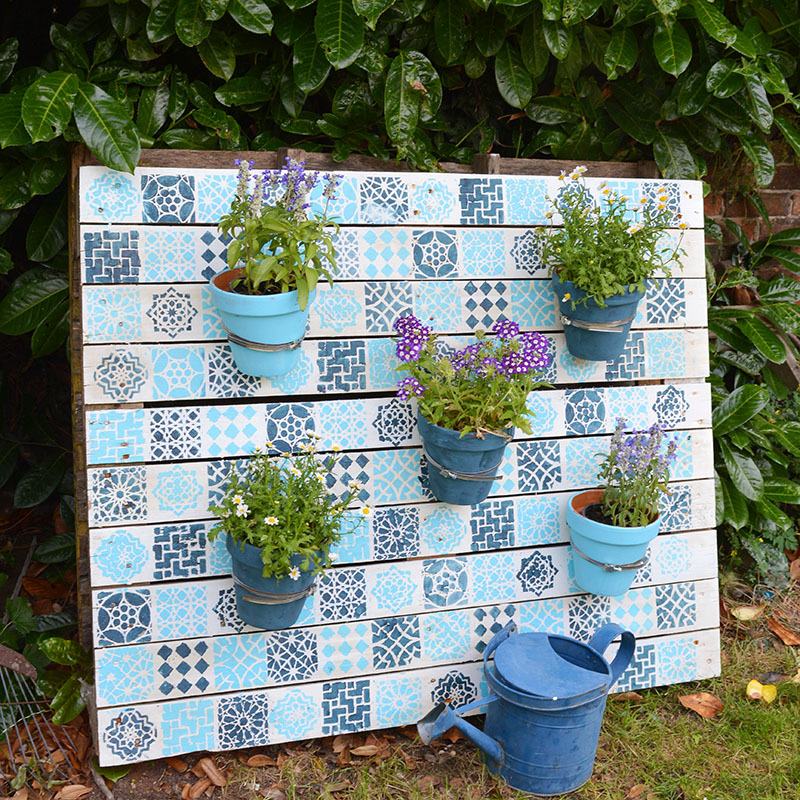 I then added plant pots to create a bright summery walled planter. My new walled garden definitely makes the garden feel more summery. It’s hard to remember it’s summer here in the UK sometimes. We are having a typical unpredictable British summer at the moment. One minute is scorching hot the next is raining and cold again. Mind you if the weather was predictable we Brits would have to think of something else to talk about. The whole painted wood pallet was a really affordable way to brighten up the garden it took me only a couple of hours to do. The pallet was free, I already had the pots and I used left over paint. Being made of sturdy pallet wood the planter should hopefully last a good few years too. 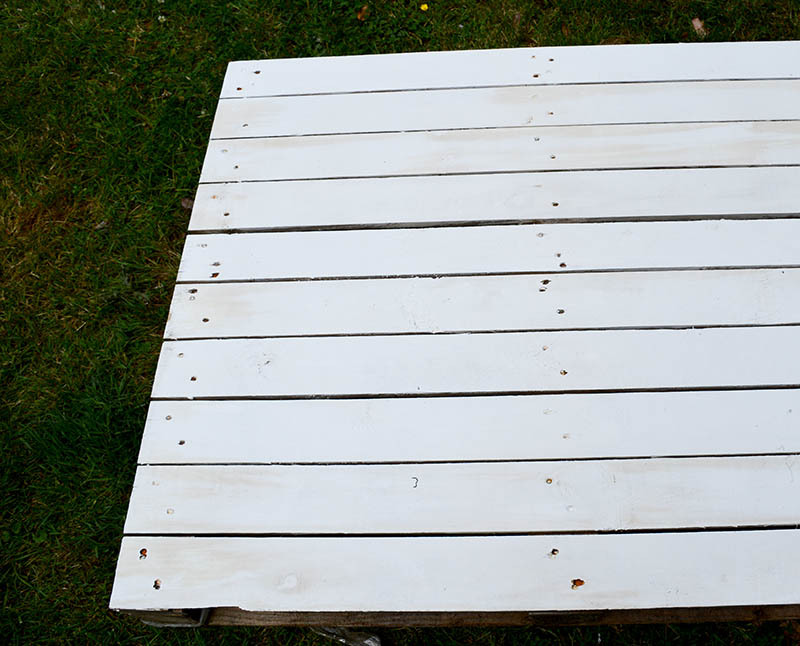 Pallet – I just pick mine up from skips(dumpsters). 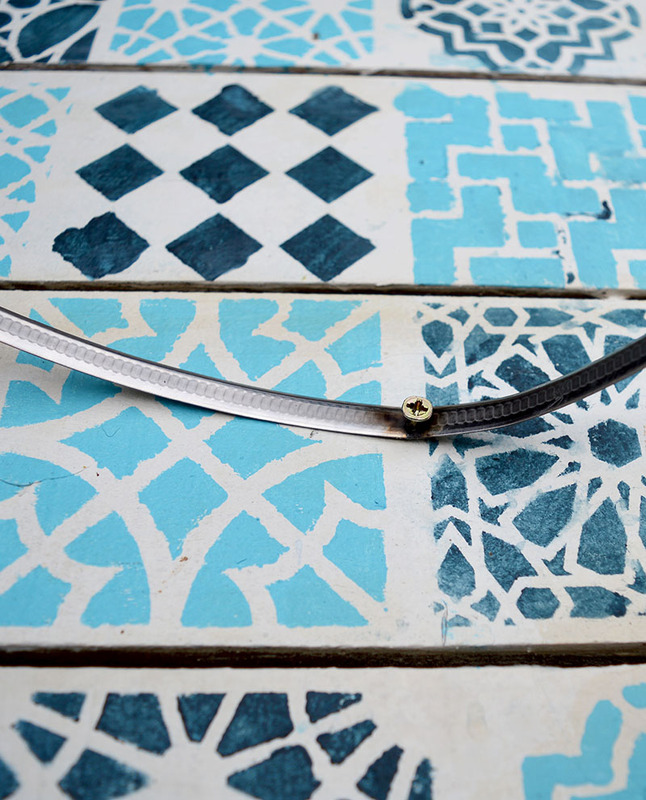 Moroccan Tile Stencil – This was a large 12″by 12″ stencil which made the stenciling quick. Paint – I just used paint left over from decorating. White emulsion (latex) for the background and two different shades of blue paint for the stencil one was a latex paint and the other was chalkboard paint. You could also use acrylic paints with the stencils. 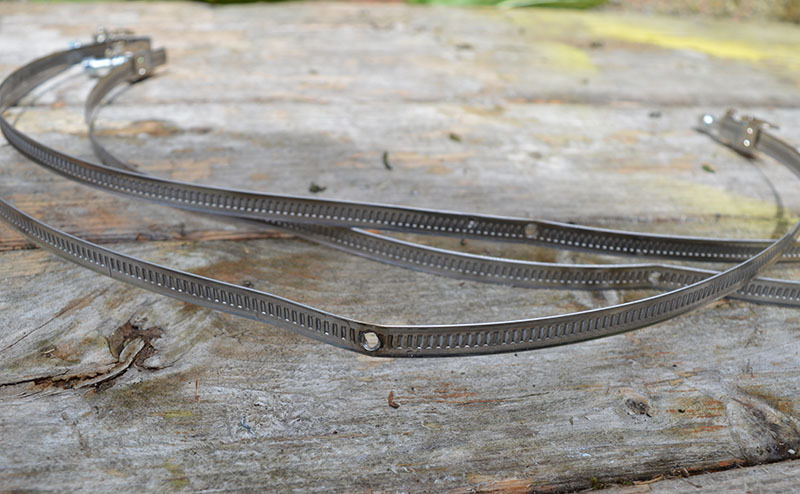 Jubilie clips /hose clamps – large enough for the plant pots you use. 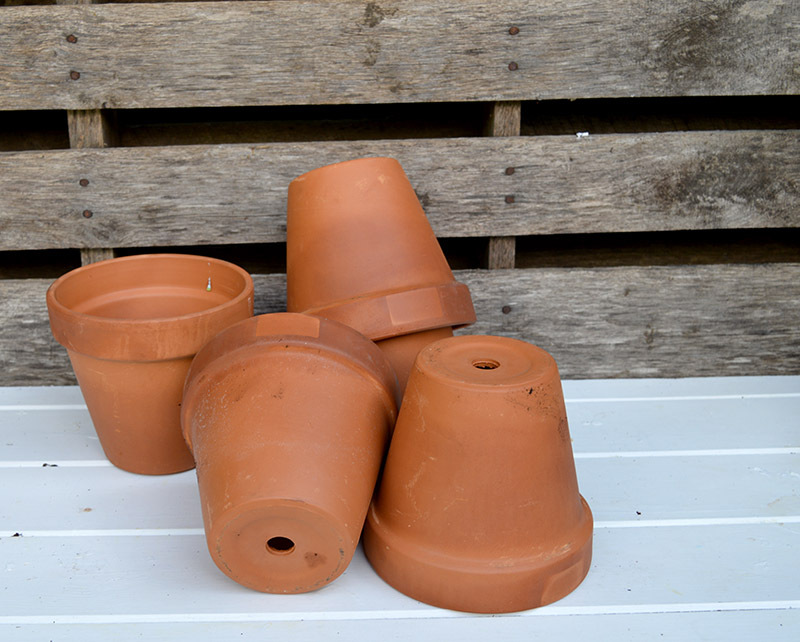 Terracotta pots – I used five 17cm pots. A sealant for the paint, varnish or clear furniture wax. Paint brushes and stencil brushes. 1. The first thing I did was paint the pallet white. This was to be the background of my garden. I used white emulsion (latex) paint as I had some left over from decorating the house. Any white or pale colour will do. 2. Once the white paint was dry I began my stenciling. The first thing to do is to tape down the Moroccan tile stencil at the edges in the corner of the pallet. This is to stop it moving when stenciling. 3. The stencil is divided into 9 Moroccan tiles. I painted the tiles in 2 different blue paints one light and one dark. Alternating each tile to create a checkerboard effect. Good tips when stenciling is not to have too much paint on your brush and to paint with a stippling motion. This will stop the paint smudging and spreading under the stencil. 4. Whilst the stenciled pallet wood was drying. 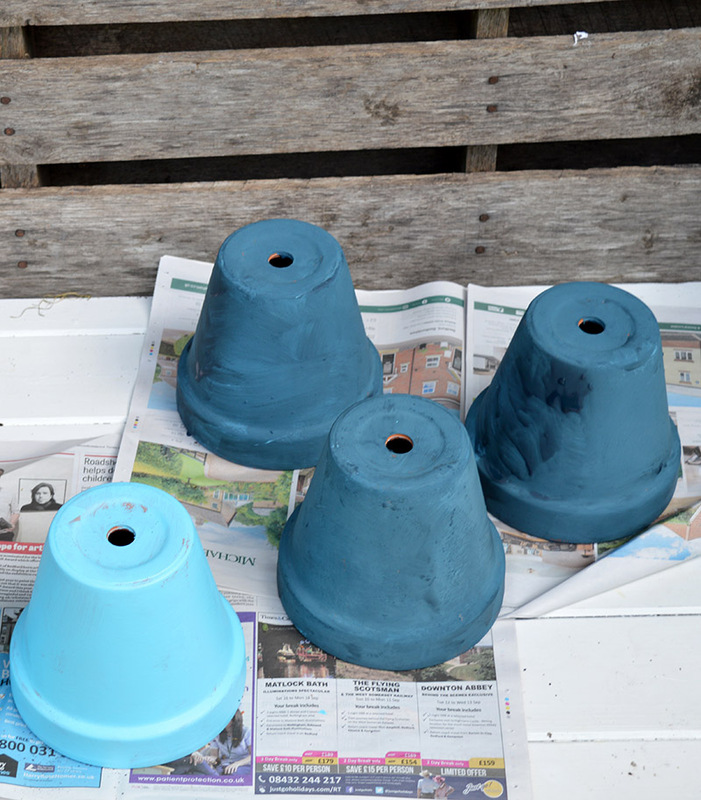 I painted the terracotta plant pots in the same colours as I used for the Moroccan tile stenciling. 1. You will need to drill a screw hole in each jubilee clips to be able to attach them to the pallet. 2. As I had quite large pots I only used 5 for my planter. If you have smaller pots you may want to use more. Each clip was screwed to the pallet wood in a 5 dot dice pattern. I closed the jubilee clips up. As the plant pots are tapered they simply just slot into the jubilee clips. This makes them very easy to change and remove when needed. I’m really pleased with how this painted wood pallet has turned out. 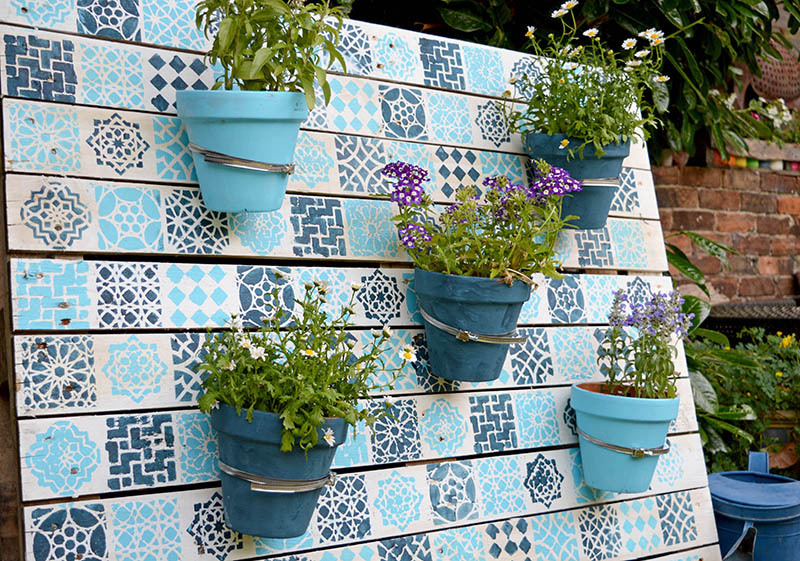 It looks awesome in my garden and I love the Moroccan feel that the stencil gives to the planter wall. If you like this you should check out some of my other more colourful garden tutorials. I’m not very artistic so I’m not sure I would do well with the stencils; however, you have me a wonderful idea. I could just buy some tiles and attach them with a strong adhesive. What do you think? tiling it would make the pallet very very heavy. If you really don’t want to try the stencil you can buy vinyl tile stickers. So perhaps try those. I’ve seen them on eBay. Maybe, but the thin wood may not have the strength to hold the weight. Perhaps thinner lighter substitutes – aluminum, or vinyl tile-like material? Craft shop perhaps? If whatever you’re using isn’t already precut, then you should get some kind of straight-edge cutter to make exact cuts, or it won’t look like tiles. I would find that hard to do. Re stenciling, I’m not a bit coordinated, but got great results the first time I did it, on my kids’ closet doors and furniture. Really all you have to do is apply the paint over the holes in the stencil. You do not have to do it perfectly; excess will stay on the stencil, and if you miss a little you just have slightly softer edges on your project. You are not painting within the lines by guiding the brush horizontally, you’re dabbing the paint over the holes; a stenciling brush is somewhat stiff but with soft tips, and by dabbing I mean sort of poking the brush downwards repeatedly. My concern re painting on pallets is that the wood is not only thin, but also splintery and fuzzy. I have no idea how stenciling that is going to hide that. Thank you for your tips. Pallet wood however is not thin wood it’s is very strong as it is designed to carry large loads. The pallet planter has bow gone through it’s second season in my garden and still looks great and is a s strong as the day I painted it. This is adorable! 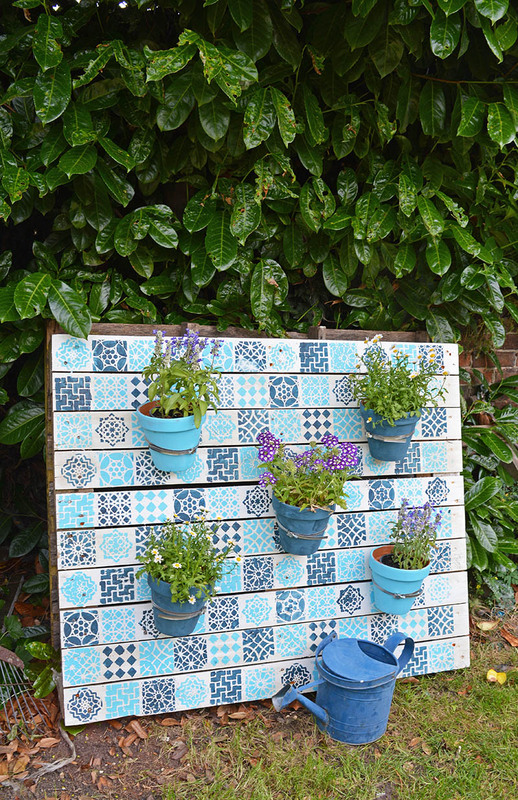 I love the tiled look you gave the pallet with the small stencils! Beautiful job! Thank you, pallets are fun to paint and it doesn’t matter if you mess it up. Absolutely beautiful. 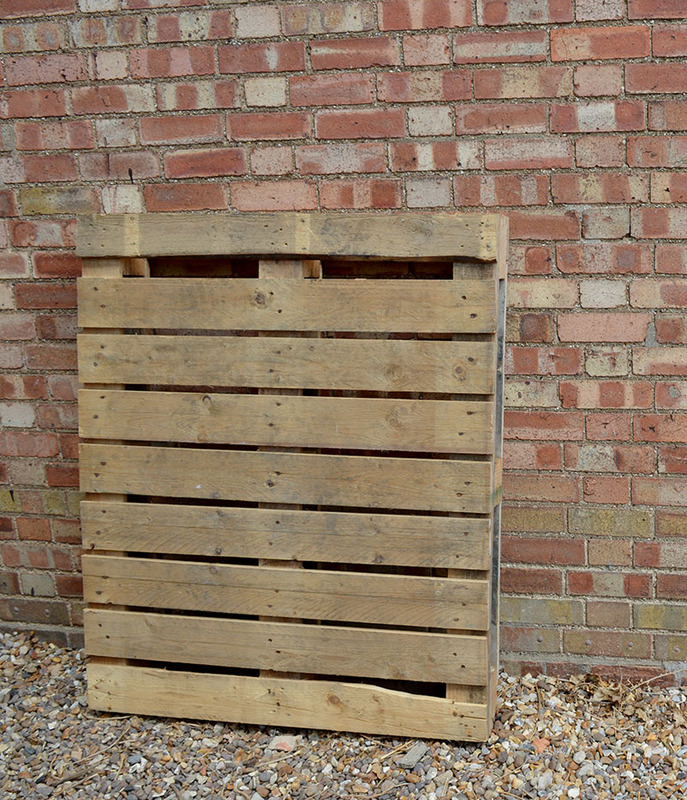 I have wanted a pallet planter using the slots for the plants to come through with landscaping cloth stapled to the back, but this is gorgeous. I’d paint 4 more and make a little patio with a bistro table and 2 chairs! How creative! At first glance I was thinking you painted each of those square individually and was thinking how much time that would take, but using a stencil! Brilliant! What a great addition to your outdoor decor! Thanks so much for sharing at Celebrate Your Story! Thank you, Chloe. The big stencil certainly speeded things up. Thank you! I bet it would look even better with actual tiles. This looks fabulous. I love the colors you used and the stencil. Thank you, Amberjane. Have you tried eBay you might find one there that will ship to Ireland. This is stunning Claire, such a lovely way to use a pallet. Your wall turned out beautifully. It will absolutely add brightness and warmth to your yard. Great work. Thank you, it certainly brightens the garden up. What a great idea. I thought it was tiles at first. Thank you, that was the idea they are supposed to resemble Moroccan tiles. LOVE that! I need to do this for my living room that need a new look! Thank you, and good luck with it. I don’t think this could be anymore beautiful! It just catches my eye and I want to look at it all day. Wonderful job, Claire! Thank you so much for sharing this with us at Funtastic Friday. Pinned & sharing! Thank you so much, Angie and thanks for the shares. It really does brighten up my garden especially on a wet and rainy British summers day like today! Love everything about this, Claire! Thanks for sharing @ Vintage Charm–pinned! Wow! How pretty and creative. I also like how you painted the planters to coordinate with the tiles. Thank you Lea, I thought it would look better with matching planters. Thank you! Yes take pallets apart is a pain. What a beautiful idea! I love the stenciling and the colors are wonderful! Love how this project turned out. You really created something far more creative than your typical vertical planter with this Moroccan theme. Absolutely gorgeous! Thank you so much Jesica. I do like the Moroccan trend at the moment. Just saw this at the Vintage Charm Link Party and I LOVE it!! The blues are beautiful! Good job! Thanks so much for sharing! Thank you Jan! I do like my blues. At first, I totally thought you had put down individual tiles. Great stencil job! Very pretty vertical planter. This is a lovely planter. Would the colors get ruined if one overwaters the plants? Thank you! 😊 I did seal it with wax and it hasn’t happened so far, it’s even been through a couple of thunderstorms so it should be ok. Very nice pattern, I love the colours, great idea and work! Greethings! Thank you 😊 I do like the Moroccan style stencil. Claire ,You did a great job. They look like tiles. I painted a pallet with a white washed effect to give a beachy effect & used plant pots with hangers on. Thank you, Shirley. I’m sure your beach pallet looks lovely. That stencil is beautiful…love the whole look! This looks great, Claire! I love the colors and the stencil you used. That’s another fabulous upcycle project. Thank you Julia, the stencil is great I’m eyeing up other things to paint. This is a fabulous vertical planter! I’ve seen photos of lots of pallet planters with the wood left natural. But, this one really goes above and beyond. I love the Moroccan tile look. So creative! Thank you, I’m really into Moroccan tiles at the moment. Oh my Claire, that is absolutely gorgeous! I want it in my back yard.